A few weeks ago a Novation Launchkey 61 landed at PTE HQ for me to take a look at. On a good week I can have several keyboards littering the studio, in fact so many that only an octopus who plays like Chick Corea would have any chance of making real use out of them. I say this to indicate that a lot of controller keyboards pass through my hands and the thought of reviewing a budget controller keyboard is my least favourite task. It’s not that I’m a snob, at least not about controller keyboards, shoes and restaurants yes, but controller keyboards no. I appreciate that there are varying needs and budgets, but I do get attached to the ones I like, so even the simple task of swapping from my trusty stead to a newbie takes some energy. Anyway, I eventually took the Novation Launchkey 61 out of the box and gave it pride of place on my Ultimate Support stand (note the stand costs more than the keyboard) and I was ready to take a look at it. The NLK61 was of interest to me for a couple of reasons, the first was the features to price ratio, in other words you get a lot for your money. Secondly it also has Pro Tools integration built in so you can control the transport, faders, mutes and also assign MIDI controller too. All for not much more than a decent pair of shoes or a meal from aforementioned restaurants. Joking apart, the Launchkey 25, 49 and 61 versions clock in at £99, £129 and £159 respectively, so they offer a lot of bang for your buck. In the words of Novation “Launchkey is a range of 25, 49 and 61 note keyboard controllers with up to 50 physical controls including 16 velocity-sensitive multi-colour launch pads that trigger and stop clips - and launch scenes - in Ableton Live. As well as enabling hands-on control of your DAW’s mixer, instruments and more, Launchkey is an integrated software/hardware instrument. The control surface has been designed to work tightly alongside two intuitive apps for iPad: the Launchkey app and the Launchpad app* - plus the powerful V-Station & Bass Station synth plug-ins for Mac and Windows.” To be frank… a steal! One of the first things I wanted to check was the Pro Tools integration, I’m on a Mac so there are no drivers to install. 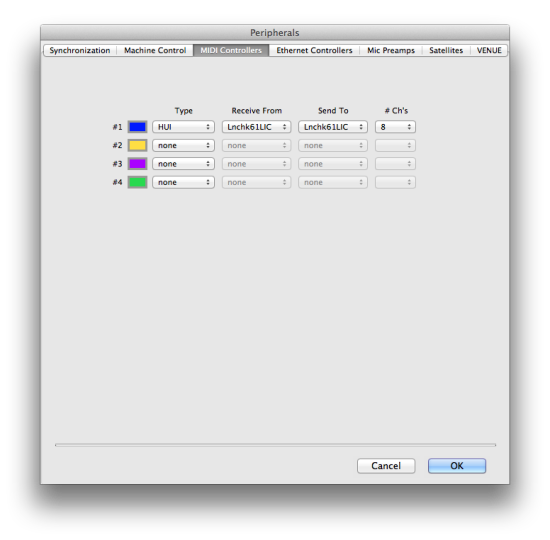 Simply open up the peripherals menu in Pro Tools and set it up via HUI protocol, see below. However on this occasion it didn’t want to play ball, it didn’t matter how many times I tried to sort if out it wouldn’t play nice, so no cigar for me. I put a call into their support line and within 5 minutes they called me back. After a little bit of discussion it transpired that the USB hub I had used to connect it to my Mac was not helping. Once I connected it to the Mac directly then all was good, I could then plug it back into the hub… please note. Full marks to Novation support, not their fault, but they fixed it with a smile and didn’t mention that I’d been a plonker. Once this was working then I could control the transport, faders and mute via the NLK61. I could use the pads to put in drum parts, the keyboard to play in (yes you guessed it) keyboard parts and assign controllers for MIDI control. In use the NLK61 is a nifty MIDI controller, my only criticism is the money has been saved on the keyboard which feels a little soft and has the action of a typewriter made from jelly. Don’t get me wrong it’s not bad, it’s just not the kind action you want when laying down piano parts, but for everyday MIDI sequencing it will be more than adequate. However if you are on a tight budget and want a MIDI controller for the centre of your Pro Tools studio then you should take a look at the Novation Launchkey series of keyboards - they work with Mac, PC and iPad and come with free Apps and two FREE virtual instruments, note that one is VST so you will need to either wrap it or host it in something else to use it in Pro Tools. If you are looking for a new MIDI controller and want a lot of bang for your buck then check out the Novation Launchkey 25,49, or 61 they represent outstanding value for money.